After taking the strong hold of Zion, King David "built round about from Millo and inward" (II Samuel 5:9). I Chronicles 11:7-8 says, "And David dwelt in the castle; therefore they called it the city of David. And he built the city round about, even from Millo round about: and Joab repaired the rest of the city." The idea that David could have constructed a four-chambered gate just to the north of the strong hold isn't so far fetched, especially in light of the fact that, according to Scripture, much of his time was spent making preparations for the building of the House of the Lord God which was to be built on Mount Moriah to the north. (I Chronicles - chapter 22). ​Eilat Mazar proposed a date for the construction of the Gatehouse in Ophel, based on black juglet evidence: "Later than the Qeiyafa assemblage, apparently from the second half of the 10th century." “The lime floor, which was discovered during our 1986 excavations, comprised the latest floor of the gatehouse passageway. …the lowest earth fill, which directly overlay bedrock, would likely be undisturbed and would perhaps even provide finds that would reveal when the gatehouse had been constructed. In the lower fill layer, a scarab was discovered, displaying Egyptian hieroglyphics which were dated by Prof. Keel to the reign of King Thutmosis III (1479-1426 BCE) or a short time later. Also found in this layer was pottery, with the main vessel type being a small bowl with a simple rim and either round. Or slightly carinated, sides. None of the bowls featured red slip or burnishing. Also retrieved were krater sherds with protruding rims and straight sides; cooking pots with long, inverted ridged rims; pithoi with thick, rounded outverted rims; and storage jars with slightly inverted necks and simple rims, or with straight necks and slightly protruding rims. A small handle fragment of a black juglet was also discovered here, similar to that from the Royal Structure. All in all, this assemblage greatly resembles that from the site of Khirbet Qeiyafa, a well-planned, fortified city located in the Judean Shephelah, excavated by Prof. Yosef Garfinkel and Saar Ganor. What makes Khirbet Qeiyafa such a key site for chronological analysis is that it was only very briefly settled during the time period relevant to our discussion, and then deserted following a violent destruction, leaving us with a very clear stratigraphic context. In between what may have been a small Middle Bronze Age village (the first half of the 2nd millennium BCE) and a late 4th century BCE Hellenistic settlement is only one stratum of what seems to have been an Iron Age city. Both pottery and carbon-14 analysis have dated this city to ca. 1015-975 BCE, a time frame that fits the reign of King David, but is too early for King Solomon. Although the amount of pottery retrieved from the lowest fill layer at the Gatehouse is relatively small, the lack of red slip and burnishing makes for a greater resemblance to the Qeiyafa assemblage, where those characteristics also only rarely appear. The black juglet type, typical of the 10th century BCE, with a handle fragment found in the lowest Gatehouse fill and an intact example found in the fill beneath the lower floor of the Royal Structure, do not appear at all at Qeiyafa – which indicates that the lower layer of the Gatehouse should be dated later than Qeiyafa, though still within the 10th century. We thus determined that the pottery from the lowest fill layer dates later than the Qeiyafa assemblage, apparently from the second half of the 10th century, thus supplying a date for the construction of the Gatehouse” (Eilat Mazar, Discovering the Solomonic Wall in Jerusalem, 2011, pp. 105; 107-109). As seen below, examples of the black juglet type are now known from excavations at Qeiyafa. Therefore, the lower layer of the Ophel Gatehouse could be dated from the first half of the 10th century. ​Yosef Garfinkel proposed a date for the main period of occupation at Khirbet Qeiyafa, based partly on the newly-found black juglet evidence and radiocarbon dating of short-lived organic material: "The late 11th/early 10th centuries BCE (1020–980 BCE)." ​“The production and distribution of the black juglets could have been one expression of political, economic and social change at that time, possibly related to the initial stages of state formation, as assumed by the excavators. The date of the main period of occupation at Khirbet Qeiyafa, to which the overwhelming majority of the remains belong, has been determined by the excavators as the late 11th/early 10th centuries BCE (1020–980 BCE), culturally and historically defined as the late Iron I and the very beginning of Iron Age IIA. This date was based on stratigraphic and ceramic considerations, as well as radiocarbon dating of short-lived organic material” (Garfinkel and Ganor 2009:4, 8; Garfinkel and Kang 2011; Garfinkel et al. 2012). The black juglet type, typical of the 10th century BCE, with a handle fragment found in the lowest Gatehouse fill in Ophel and an intact example found in the fill beneath the lower floor of the Royal Structure, does appear at Qeiyafa! This implies that the lower layer of the Gatehouse may date to the same period as the Qeiyafa assemblage (no later than the first third of the 10th century BCE), a time frame that fits the reign of King David, but is too early for King Solomon, thus supplying a date for the construction of the Gatehouse. “Biblical tradition holds that David bought a threshing floor located outside the city and that Solomon built the temple there, on the hill located north of the City of David and known ever after as the Temple Mount. Kenyon Discovered stratified remains that she interpreted as evidence for the Solomonic expansion of the city in three areas, all of which were located only a short distance north of the stepped rampart: Square A XVIII, Site H, and Site M. In Square XVIII Kenyon discovered a palmette (i.e., Proto-Aeolic) capital and a number of ashlar blocks that she dated to the tenth century “at the foot of the scarp on the eastern crest of the eastern ridge. Because details of Kenyon’s discoveries remained unpublished for many years, and because no other evidence of contemporary occupation have been recovered from the City of David’s hill crest, most scholars have long regarded Kenyon’s interpretations of the remains that she dated to the tenth century B.C.E. from Sites H and M skeptically. A notable exception is Eilat Mazar, who has argued that Kenyon’s discoveries indicate that David’s palace was located in the vicinity of Kenyon’s Site H.
Similarly unclear is the construction date of monumental architecture found in excavations directed by Benjamin Mazar and Eilat Mazar immediately south of the Temple Mount. 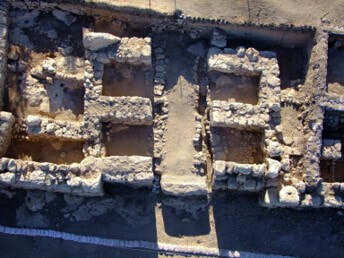 The earliest floors in building remains interpreted by Eilat Mazar as an Iron Age gateway leading into the Royal precinct contained pottery dating to the eighth century B.C.E. However, E. Mazar found a small black juglet sheltered between stones of the structure’s foundation courses. 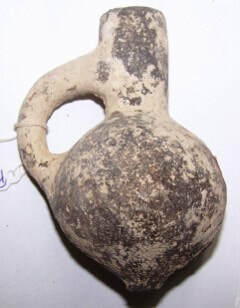 The handle attached to the center of the juglet’s narrow neck, its small round body, and its button base all suggest that both the juglet and the construction date of the building remains in which it was found predate the eighth century B.C.E. Although the presence of this lone juglet in a foundation course is not sufficient to say with certainty by how long these building remains predate the eighth century B.C.E., the juglet itself is a type traditionally dated to the tenth century B.C.E. that is commonly found only at northern sites demonstrating connections with the Phoenician coast” (Jane M. Cahill, Jerusalem in Bible and Archaeology, Jerusalem at the Time of the United Monarchy: The Archaeological Evidence, 2003, pp. 68-70). The four-chambered gate at Khirbet Qeiyafa "The late 11th/early 10th centuries BCE (1020–980 BCE)." ​The four-chambered gate (left)connected to the Royal Structure. Notice the later Extra Tower attached to the outer wall at bottom right. ​Eilat Mazar described her excavations at the "Extra Tower"
"When we finished dismantling the northern face of the Byzantine wall, we discovered the remains of another wall built directly upon the sloping bedrock. This wall, built of small-and medium-sized fieldstones, was best preserved on its southern side, where it rose to a height of 1.4 m, while the less well-preserved northern side reached only o.5 m in height. We estimated the width of the wall to be at least 1 m. This wall lay parallel to the southeastern wall of the Royal Structure and abutted the northeastern wall of the Extra Tower. We could not define its exact purpose, and it would have been very helpful had Kenyon separated the contents of the earth fill in the 50 centimeters that separated this wall, the northeastern wall of the Extra Tower, with the southern wall of the Royal Structure. Had she done so, we would have been given a much more secure terminus ante quem for the construction of the Extra Tower. Had Kenyon known of the existence of the wall that lay parallel to the southeastern wall of the Royal Structure, she probably would have been particularly careful to isolate the lowest part of the fill, immediately associating it with the surrounding walls. ​ ...Upon reaching bedrock, we were able to measure the wall of the Extra Tower that until then had been hidden from view, which we exposed to a length of 3.8 m. ...The ashlars featured partially drafted margins surrounding a prominent, unworked boss in the center. We noticed that some were laid as headers and stretchers, though this method was not consistently followed, and it was just this sort of irregularity that led to Kenyon to conclude that this wall had been built of stones in secondary use. It seemed to us, that the way in which the stones were laid actually demonstrated constructional flexibility - which only highly skilled builders would have possessed. This flexibility is also demonstrated in the way the stones were laid one above the other, as well as in the way the bedrock was cut to accommodate the base of the wall. ​ Just as was described by Kenyon, we saw how the northeastern wall of the Extra Tower abutted another wall, which she identified as part of the city wall, at a right angle. The wall was finely built, directly upon bedrock, of stones smaller than those used in the Extra Tower. It was preserved to nine courses, or about 4 m, in height, with its partially worked stones averaging 0.4 m high and 0.7-12 m long. We now know it to be the outer southeastern wall of the Royal Structure (Building D), and were able to trace it for a distance of 4.5 m, all the way to its southernmost corner, before it turned at a right angle toward the northwest. We were able to determine that the Royal Structure was built first, and that only sometime later was the Extra Tower attached to it. This conclusion was supported by the fact that a foundation trench of the Extra Tower, cut into bedrock, starts at its meeting point with the southeastern wall of the Royal Structure" (Eilat Mazar, Discovering the Solomonic Wall in Jerusalem, 2011, pp. 74, 76). ​ In as much as the "Royal Structure" is attached at its southern end to the four-chambered gate, and likely constructed at the same time, it becomes clear that if the Extra Tower was constructed by Solomon's builders and the Royal Structure preceded it, then the Royal Structure and four-chambered gate may have been constructed earlier by David's builders. "We cleaned a small area of about 1x1 m at the foot of the juncture of the southeastern wall of the Royal Structure with the Straight Wall, where we assumed that any earlier remains would have been disturbed by the later cistern, and were thus surprised to uncover a number of undisturbed stratified layers from the First Temple period lying adjacent to the southeastern face of both walls down to bedrock. ...Needless to say, all the earth fills from his excavation were sent for wet sifting, with the lowest 20 cm found to contain mainly bowl and jar sherds, similar to those found in the lower gatehouse fill, and dated to the second half of the 10th century. The continuation of this lowest layer in the direction of the Extra Tower in the west may very well have been the lowest layer missed by Kenyon during her excavation in this square, which could have supplied a much earlier terminus ante quem for the construction of the tower" (Eilat Mazar, Discovering the Solomonic Wall in Jerusalem, 2011, pp. 121, 122). In a reply to my query in July of 2010 Dr. Leen Ritmeyer stated, "If you would examine the elevation, section and Isometric drawing of the Ophel Wall on Warren's Plans, Elevations, Sections, etc., (1884), Plate 40, then it is clear that this L-shaped wall is built against an earlier wall and one can still see today that two different First Temple period building phases are represented in this area. That is why Warren called this wall section the "Extra Tower" or" Corner Turret", i.e., it is a tower that was later added to strengthen an earlier fortification or part of the city wall. If the L-shaped wall , as you insist, is Solomonic, does that make the wall against which it is built Canaanite?" (http://www.ritmeyer.com/2010/07/31/first-temple-period-wall-found-in-jerusalem-revisited/). My response to that question is that there is another possibility. Someone built a gate there, and (using Phoenician masons) connected a casemate wall to the gate. Later, someone (also using Phoenician masons) built a tower to strengthen the wall. The first phase of construction could have been completed under the leadership of King David (II Samuel 5:11 and I Chronicles 14:1)! It should be noted here that the four-chambered gate associated with this wall resembles the four-chambered gates at Khirbet Qeiyafa which date to David's time. David speaks of his desire to see the walls of Jerusalem materialize even before he built an altar for sacrifice (Psalm 51:18). He built an altar unto the Lord in the threshingfloor of Araunah the Jebusite (II Samuel 24:18) so we know that there was construction activity to the north of the city of David in David's time. The Givati parking lot excavations, north of the city of David, revealed evidence of construction activity there before the city's expansion by King Hezekiah. The IAA report stated "... this phase was dated earlier than eighth century BCE, based on the abundance of ceramic finds." II Samuel 5:9 says,"So David dwelt in the fort, and called it the city of David. And David built round about... ." Also, I Chronicles 11:8 says, "And he built the city round about, even from Millo round about ... ." I Chronicles 22:2 says, "And David commanded to gather together the strangers that were in the land of Israel; and he set masons to hew wrought stones to build the house of God."